It is based on semiconductor LM35 temperature sensor. 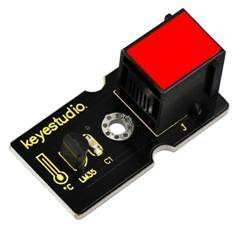 A temperature sensor is exactly what it sounds like - a sensor used to measure ambient temperature. It is effective in the range between 0 degree Celsius and 100 degree Celsius. Sensitivity is 10mV per degree Celsius. The output voltage is proportional to the temperature. 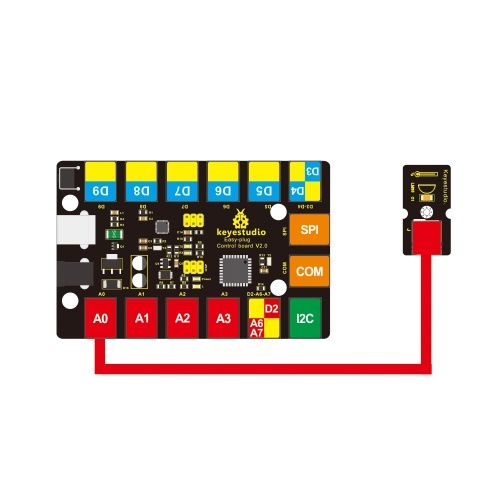 Connect the EASY Plug LM35 temperature sensor to control board using an RJ11 cable. Then connect the control board to your PC with a USB cable. Done uploading the code, open the serial monitor and set the baud rate to 9600, you should see the analog temperature value.